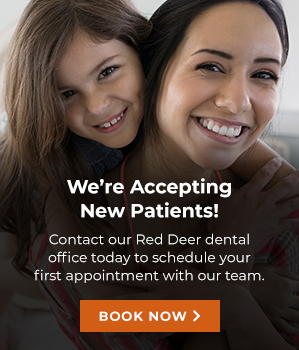 At Southpointe Dental in Red Deer, Alberta we offer a variety of dental services for you and your family. At Southpointe Dental in Red Deer, Alberta we offer cosmetic services such as teeth whitening, inlays and onlays, dental implant restorations and more. At Southpointe Dental, our Red Deer dentists provide root canal therapy for patients who are experiencing pain due to an infected tooth. At Southpointe Dental, our Red Deer dentists provide TMJ (TMD) therapy for patients who are experiencing symptoms of TMD. We offer traditional braces as well as Invisalign invisible braces for those looking to straighten their teeth, correct their bite and enhance their smile. Our dentist provides non-surgical gum therapy for patients who are experiencing gingivitis, gum disease and other problems.